ASHFORD UNITED boss Danny Lye says winning the Kent Reliance Senior Trophy for the first time is only half the job done. CHAMPIONS: Ashford United celebrate winning the Kent Senior Trophy for the first time after previously losing to Beckenham Town and Sheppey United. Ashford United lost to Beckenham Town and Sheppey United in their previous Finals, but they are now on course of completing the double. They have four league games remaining and are three points clear of Crowborough Athletic, who have a game in hand. Lye’s side defeated Sutton Athletic (3-2); Corinthian (4-1), Whitstable Town (1-0) and Canterbury City (3-2) en-route to this Final, while Cray Valley got past Hollands & Blair (3-2), Tunbridge Wells (1-0), Lordswood (4-0) and Deal Town (3-1 on penalties after a 1-1 draw) to reach their first Final in this competition. The Millers, who went into the game in fifth-place in the table on 63 points from 33 games, 17 points adrift of Ashford United, but with the statistic of losing to Ashford United three times this season. But Cray Valley got off to a dream start on a warm and glorious sunny day in Maidstone, as central defender Laurence Collins swept home his first goal of the season from a free-kick after only 140 seconds. Ashford United equalised through Shaun Welford’s clinical finish into the bottom corner, before the 37-year-old won it with ten minutes remaining with a trademark header to score his 41st goal of the season. “It means more to the club than me,” said Lye as he emerged for the post-match press conference. Cray Valley manager James Collins was clearly a disappointed during the post-match press conference. “Massively proud of the players. I thought we gave a really good account of ourselves,” he said. “Obviously, it hurts to lose, but I thought we gave a good account of ourselves in tough conditions. I’m just massively proud of the players’ and proud for the club. I think everyone associated with the club should be proud of the players’. The game was watched by a sun-kissed crowd of 726, although Vanarama National League club Maidstone United only opened two sides of their stadium for this showpiece. Ashford United’s fans showed disrespect to Cray Valley’s players when their names were read out over the public address system, shouting out “who?” after every players’ name – but they were silenced when Collins struck. Set-piece master Jason Thompson floated in a free-kick from just outside the corner of the penalty box. The ball looped into Jamie Wood’s feet on the other side and the Millers’ skipper slipped the ball inside for Collins to sweep his left-footed shot on the turn into the net from 12-yards. “It was a great start,” said James Collins. Welford launched the first of his three trademark long throws into the Millers box and Ashford central midfielder David Botterill’s hanging header at the far post shaded the top of the far post. Ashford United went close to equalising in the 20th minute when Botterill floated in a cross from the left and Welford made a pocket of space inside the box to cushion his side-footed volley across the keeper and past the far post from 10-yards. Another floated free-kick into the Millers box was met by Welford’s rising header, which sailed wide from eight-yards. But Ashford United deservedly equalised with 25 minutes and 13 seconds on the clock, although Wood remonstrated with referee Ben Bowles before the re-start over the decision. Jason Goodchild’s high kick on Taylor McDonagh went unpunished and the Ashford midfielder slipped the ball into Welford, who stepped inside Ashley Sains and Laurence Collins at the heart of defence and the striker slotted his right-footed shot past a flat-footed Jordan Carey from 15-yards. LEVELLER: Ashford United striker Shaun Welford slots home the equaliser. “It’s there to be won, I think and I think the ref’s right to allow it to go on. Obviously it fell to Welford’s feet and he does what he does. It was a great finish,” said Lye. Ashford United keeper George Kamurasi made a comfortable save to frustrate Ben Francis, the Milers lone striker, who cut onto his left-foot to stroke a shot towards goal from 25-yards. Rory Hill, who scored a hat-trick in Ashford’s top-of-the-table win over Crowborough Athletic eight days ago, was keen to score against his old club, hitting a right-footed drive from 30-yards, which was plucked out of the air by Carey. Laurence Collins got Carey out of jail when he used his left thigh to block Welford’s angled shot from the right-hand side of the penalty area after the Millers keeper came out to the corner of his box and failed to gather. Welford was then released down the other side of the pitch before cutting into the box and drilling his angled shot just past the foot of the near post. Hill played the ball out to Palmer, who played the ball out to George Savage, who whipped in a cross into the box but Welford rose and under pressure sent his header over the bar from four-yards. Ashford defender Pat Kingwell roamed forward with the ball down the middle of the pitch before playing the ball inside to Goodchild, who drove his first time shot just past the foot of the left-hand post from 22-yards from the centre of the pitch. “There were chances to be going in to the break sort of leading but there wasn’t any good football,” admitted Lye. “I think there were passages of play, three or four times in the game, that we actually made more than five passes and from that we actually caused problems. Cray Valley were to be denied grabbing the lead in the 36th minute, courtesy of the big frame of six foot six Ugandan goalkeeper Kamurasi. Thompson split open the otherwise solid Ashford back four to put winger Aaron Rhule through on goal and he tried to stroke his shot into the bottom far corner, Kamurasi’s huge frame got down low to his left to make a vital block. “Fantastic save wasn’t it from the big man?” said Lye. Carey was given a let-off on the stroke of half-time when he came and failed to gather Danny Stubbs’ left-wing corner and Welford rose to plant his header over the crossbar from eight-yards. It proved to be a warning for what was to come later on. Thompson then chipped in a free-kick into the Ashford box from the centre circle and Collins tried to replicate his goal but flicked his shot into the keeper’s hands from eight-yards. “I said at half-time, who’s going to be the man who get the spark into the game? Who’s going to change it and slowly but surely in the second half we started to get the edge on them,” said Lye. Collins said: “We just really don’t believe in ourselves. I said at half-time we just need to believe in ourselves a little bit more and they were putting balls into our box and we were inviting that on, which played into their hands a little bit. “We wanted to win the game, we wanted to compete. I’ve got this feeling, I don’t know if they believe in themselves as much as I believe in them and I was pleased to be in the game at one-all at half-time. We just need to believe in ourselves a little bit more on the ball and be a little bit better on the ball. Cray Valley switched their formation to 4-2-3-1 for the second half and Francis endured a frustrating afternoon up front on his own. Thompson played the ball out to Francis down the right channel and the former Dartford striker beat Kingwell but drilled a shot into the newly-erected towering empty terrace stand behind the goal. But Millers manager Collins felt his side should have grabbed the lead in the 56th minute. Winger Enoch Adjei whipped in a deep cross from the left which was hooked back across goal by right-winger Denzel Gayle, which flashed across the face of goal and Francis narrowly failed to get something on the ball in the middle. Francis struggled with an injury and was subbed with eight minutes left and Thompson went up front as sub Steve Springett took up his natural position in the heart of defence. With Ashford’s fans behind his goal, Carey was getting plenty of stick after headbutting his left-hand post three times after Adrian Stone netted a penalty on the rebound in his side’s 5-2 defeat to Ashford United on 26 February. The incident was recorded by an Ashford fan in the crowd and the national media got hold of it and Carey has received stick from rival fans ever since the incident and his television appearance on Soccer AM. He silenced them for a moment on the hour-mark when he pulled off a brilliant diving save to his left to prevent Ashford scoring. Palmer whipped in a deep cross from the right, the ball was cleared out to Hill, who took a touch and cracked a right-footed angled drive towards goal from 20-yards, which forced Carey to dive to his left to push the ball towards safety. Cray Valley went close shortly afterwards when Thompson played the ball inside to Laurence Collins, who struck a left-footed drive screaming just past the left-hand post from 25-yards, past the diving Kamurasi. But Lye was delighted with his defence for keeping Cray Valley’s threat to a minimum as central defender Stuart West put in a captain’s true man-of-the-match performance. “I thought our back four or back five kept them at arms length,” hailed Lye. This game had two highly-rated goalkeeper’s on the pitch and Carey pulled off another flying save. Savage rolled the ball inside to Hill, who curled a right-footed shot towards the top right-hand corner from 28-yards, which Carey diving to his left to push the ball around his post again. Cray Valley produced a fine three-man move when Adjei played the ball in from the left to Francis, who laid the ball out to Gayle, who beat his man on the right, cut in and his right-footed drive beat Kamurasi but was blocked by Kingwell. Halfway through the second half, referee Ben Bowles brought play back after Thompson drilled a shot past the post from 22-yards, but the central midfielder drilled his free-kick into a five-man wall. Cray Valley right-back McDonagh played the ball up into Thompson, whose left-footed drive from 35-yards screamed past the right-hand post. Cray Valley will be kicking themselves for not taking a chance just seconds before Ashford scored the winner. Thompson swung in a deep corner from the right and McDonagh was left in space but all he could do was head down and harmlessly wide. Ashford United scored a deserved winning goal, timed at 34 minutes and 39 seconds on the clock. Kamurasi launched the resulting goal-kick straight down the middle of the pitch, substitute striker Adrian Stone flicked the ball over to Palmer on the right. The winger beat his man to race down the right wing to cut the ball back to right-back Savage, who had time and space to take a touch, compose himself before whipping in a high-quality cross into the box. Carey came out and failed to collect the ball and Welford planted his header into the back of an empty net from six-yards to the delight of the Ashford fans who made this feel like a home game. WINNER: Shaun Welford (left) heads home the winner for Ashford United. “We gambled a little bit, we brought on Stoney and we brought a midfielder (Goodchild) off so we were one less in the centre but we wanted to give a bit of presence up there next to Shaun,” explained Lye. Collins refused to blame his goalkeeper for the winning goal. Kamurasi dropped Danny Smith’s cross before the big Ashford keeper pounced on the loose ball as the heat took its toll on both sets of players. Ashford United created the last chance of the game in the 89th minute. Palmer whipped in a deep cross towards the far post and Hill cut the ball onto his right-footed before stroking a shot into Carey’s chest from 16-yards and Stone’s follow-up shot bounced off Collins and went behind for a corner. 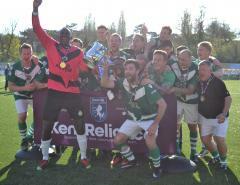 West and Kamurasi lifted the trophy before Ashford celebrated - while Collins reflected on his side’s fourth defeat to Lye’s men. Ashford host relegation-threatened Fisher at Homelands Stadium on Saturday, before the Homelands battle against tenants Canterbury City on Easter Monday. A trip to Croydon then follows (22 April), before completing their campaign at home to Rochester United on the last day of the season. Fisher and Beckenham Town are rooted in the drop zone on 25 points and both have four games left to play to avoid dropping into the First Division. Lye said: “They’re dangerous, teams like that. They need to win, they need to come at us and beat us. They’re had some lively players, Fisher always have got some attacking players who are decent so it’s going to be a tough game. “They’re all tough now, it doesn’t matter where abouts you play them in the league. We’re top, we need to win. The pressure’s on the boys a little bit that way and Fisher need to win to stay up so they’re all going to be like that. Cray Valley have five more league games left to play, starting with a home game against third-placed Sevenoaks Town on Tuesday night, aiming to finish in the top four. “We’ve got to pick ourselves up now,” said Collins, whose side are nine points adrift of Micky Collins’ side. “That’s probably took a bit out of us and we’ve picked up a couple of injuries but the boys have done well this season and we’ve got a lot of games to fit in because we’ve done well and we just have to get on with it. Ashford United: George Kamurasi, George Savage, Fraser Walker, David Botterill, Stuart West, Pat Kingwell, Ryan Palmer, Danny Stubbs (Adrian Stone 70), Shaun Welford, Jason Goodchild, Rory Hill. Cray Valley (Paper Mills): Jordan Carey, Taylor McDonagh, Danny Smith, Jamie Wood (Alastair Gordon 71), Ashley Sains, Laurence Collins, Denzel Gayle, Jason Thompson, Ben Francis (Steve Springett 82), Enoch Adjei, Aaron Rhule (Ryan Fowler 46).